I recently realized that my method of tossing the Snickerdoodle's old (but hand-me-down eligible) shoes into a big storage bag was flawed. I was really struggling to find pairs of shoes when I went searching. That's when it hit me - zip ties!!! 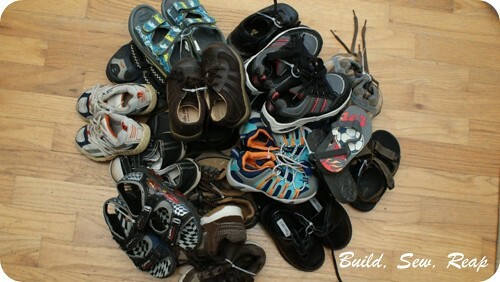 Now when he outgrows a pair of barely-worn shoes, I carefully zip tie the pair together and toss them in the bag. No more searching for shoe mates. How do you keep hand-me-downs organized?